"In fact, it indicates the opposite as hijab symbolizes the power to women," they say. So that must be why Iranian and Mideastern women risked their lives to burn the garment. 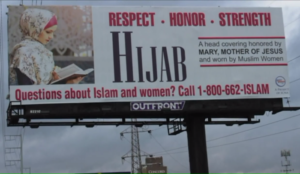 OAKBROOK TERRACE, Ill. — A local Islamic group launched a billboard campaign Monday to educate people about the hijab, the headscarf that’s often worn by Muslim women. The billboards are the first of their kind in the country, designed by a group called GainPeace, which encourages non-Muslims to call the organization and ask questions to gain a better understanding of why women wear the hijab. The billboards draw a similarity to the Christian religion where Mary is considered the mother of Jesus. She also wore a hijab. The billboards are located on Interstate 294 near Interstate 88, and Interstate 55 and LaGrange Road. “Wearing the hijab is 100 percent my choice. As contrary to the popular belief, hijab in no way oppresses us. In fact, it indicates the opposite as hijab symbolizes the power to women, and not inferiority,” Sara Ahmed, GainPeace volunteer, said. “Hijab is a simple yet powerful reminder of strength. I stand here today so that generations tomorrow do not feel deprived or threatened by their choice of dress. So that they may have the courage to stand by their beliefs, and so that this piece of cloth does not label them or categorize them with an unwanted label,” Kiran Malik, GainPeace volunteer, said.